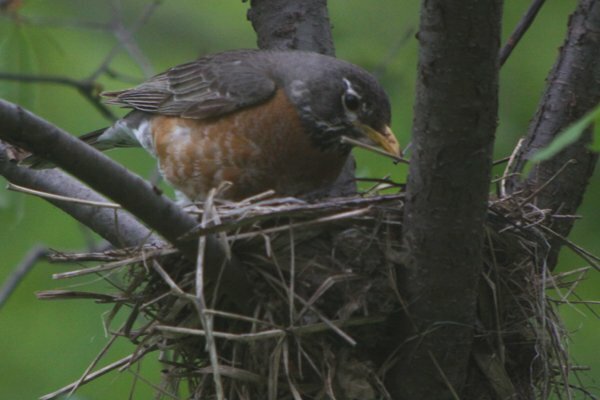 On a recent visit to Prospect Park one of the many wonderful sights was a nest belonging to a pair of American Robins in the Midwood. 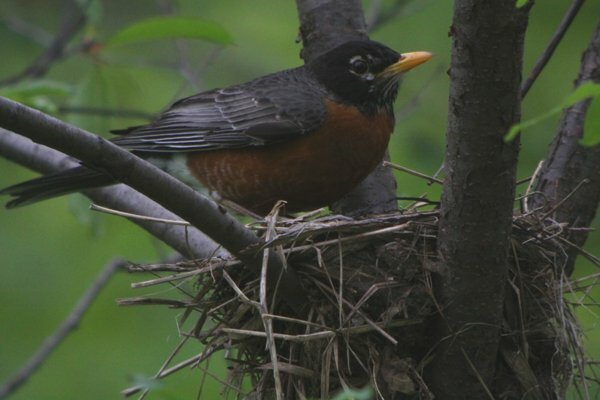 Probably one of the most familiar nests to North American birders, their eggs are known well enough to have a color named after them and many individuals are acclimatized to people, which means that they are comfortable enough to nest near our buildings. It was not a surprise to see a robin’s nest but it was nice to notice that the darker male was guarding the nest, relieving the female who likely was out taking a break from keeping the eggs warm and likely foraging for food and grabbing a drink. Not long after I spotted the nest the male suddenly took flight and the female immediately swooped in and took his place. She had dirt on her bill which made me think she must have managed to get something to eat, and paused for a moment and gave me a hard stare as if she were trying to judge my intent, and then she grabbed and moved a tiny twig before settling in to incubate. I bet that this pair successfully raises a big brood…here’s hoping that they do! My name is Linden and I am 12 years old. MY friend Cassidy and I found an American Robin’s egg but couldnt find a nest. We took the egg inside and put in some blankets, under some lights and on a heating pad, until it reached 100 degrees. We turn every once in a while and we check the temparture when we do. Were kind of stuck on what to do now. I’ve looked on the internet to find facts and stuff but theres really nothing good. Please e-mail me what you think I should do. I appreciate it, Linden.